In the 18 years since “Homerpalooza”’s debut, Abe Simpson’s warning about the fluid nature of what is and isn’t “it” has become a common refrain thrown in the faces of Kids These Days. Internet searches for the quotation show it to be a popular image-macro motif, which doubtless freaks outs old-school Simpsons fans who find image macros weird and scary. (“Back in my day,” they’ll yell at a nearby cloud, “we didn’t have fancy JPGs to go with our out-of-context Simpsons jokes! We just had text, and we liked it that way!”) It’s an ingenious piece of comedy writing, a circular punchline driving at a universal truth: Cool doesn’t stay. That’s why “Homerpalooza” works better as an articulation of “they changed what it was” than it does as an Alternative Nation time capsule. “It” changed over the course of the episode’s production cycle, in ways that even affected “Homerpalooza”’s major point of inspiration: Metallica headlined Lollapalooza in 1996, obliterating the festival’s “celebration of the underground” vibe. One year later, the lineup would reflect a then-trendy interest in electronic sounds—a year after that, Lollapalooza (its original touring iteration, at least) was dead. Youth-oriented product positioning had moved on. The moment “Homerpalooza” captures is specific: The mainstream’s co-option of alternative rock and Generation X, the age of OK Soda and the “grunge speak” hoax. The themes, however, are universal: At some point, most likely when we’re young, we all feel directly plugged into pop culture in ways other, older people can’t possibly understand. Down the line, we become Homer, our babbling about the wild, shirtless lyrics of Grand Funk Railroad falling on hostilely deaf ears. We couldn’t listen to the Abes of the world, because they were us all along. But we’re not really Homer Simpson, because Homer Simpson gets to be cool again. And all thanks to Peter Frampton’s careless roadies, who might be the most important characters on “Homerpalooza”’s stacked guest roster: If they didn’t leave Frampton’s pig cannon out in the open, it wouldn’t have met with Homer’s foot, and then there’d be no story. 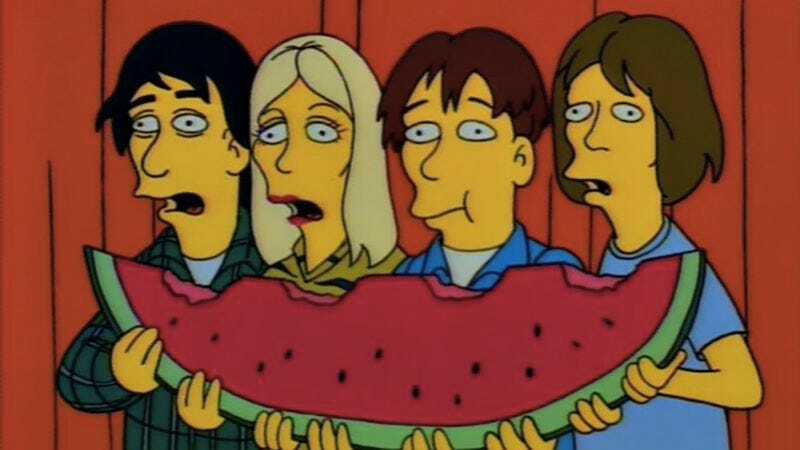 (By not guarding Frampton’s cooler, the roadies also factor into my favorite Simpsons visual joke of all time: The members of Sonic Youth sharing a single, gigantic watermelon slice.) What little narrative there is to “Homerpalooza” works through “Homer gets a new job”/“Homer’s life is threatened” beats that were starting to feel tired by season seven; the reasons for the episode’s enduring appeal are largely gag-based. The musicians aren’t among the show’s most compelling one-off presences, but the episode (scripted by Brent Forrester from a David X. Cohen concept) works with that. Like “Homer At The Bat,” “Homerpalooza” meets its guest stars halfway, providing the comedy chops so that Billy Corgan et al. don’t have to bring their own. They’re all game participants, however, with Corgan especially serving as a capable comic foil to Homer. But the flat affect of line readings from Kim Gordon and D’Arcy Wretzky suit “Homerpalooza,” with its gags about despondent youth (“REGISTER NOT TO VOTE”) and overplayed irony (“Oh here comes that cannonball guy, he’s cool.” “Are you being sarcastic, dude?” “I don’t even know anymore”). That’s an attitude that’s difficult to satirize without giving into its lackadaisical energy, to which Homer is the perfect counterweight. Even if he wasn’t a middle-aged father of three, he’d be an odd fit for this crowd: He cares too deeply about appearing cool, and he’s too enthusiastic about expressing how cool he is once he achieves that status. More than anything else, Homer seeks validation in “Homerpalooza.” He wants Bart and Lisa’s admiration. He wants the Hullabalooza crowd to know he’s a “successful freak,” too. And he wants to know that this is a way in which he can keep on living, even as he finds himself relocated from the “New Releases” section to the oldies bin. But this desire could literally kill him. Marge’s slow-dawning realization at Homer’s big homecoming show—“Cannons are designed to hurt! They’re designed to hurt!”—cuts through her husband’s phony-baloney rocker pretensions. Being beloved by thousands has not granted Homer immortality; this little nostalgia trip is endangering his life, the real life Homer has established at 742 Evergreen Terrace. The Simpsons jabbed at alt-rock’s inability to deny the allure of fur coats, orchestral accompaniment, and other symbols of rock ’n’ roll excess, but the show couldn’t predict what would happen to its guests when other people changed what “it” was, thus making them no longer “it.” Corgan opened a tea shop in the Chicago suburbs, where he later staged an eight-hour musical tribute to Herman Hesse’s Siddhartha. Sonic Youth soldiered on for another decade-and-a-half—as did Gordon’s marriage to Thurston Moore, until a midlife crisis on Moore’s part put an end to the band and the union. Cypress Hill has spent the last few years collaborating with EDM artists and advocating for the decriminalization of marijuana—so I suppose B-Real and company have done a pretty good job of staying true to the versions of themselves portrayed in “Homerpalooza.” (Theoretical first meeting between Cypress Hill and Rusko: “Do you know ‘Insane In The Brain’?” “I… mostly know dubstep. But I could give it a shot.”) Not even The Simpsons could keep it together across all these years. But what “Homerpalooza” does well is not the suggestion that this specific period in time will be looked upon and laughed at. What “Homerpalooza” does well is the truism that every era of pop culture will appear ludicrous to future generations—just as they’ll appear ludicrous to those who come after them. Heed Abe Simpson’s words, youths of 2014, and enjoy having a finger on the pulse before trying to do so winds up getting you killed. Three years later, Austin Powers: The Spy Who Shagged Me would prove that the Alan Parsons Project was in fact a “laser,” and not a hovercraft. D’Arcy on her extracurricular activities: “Hey, I wasn’t a weirdo! I was in the audio-visual club.” Hey, I’m in the audio-visual club, too! 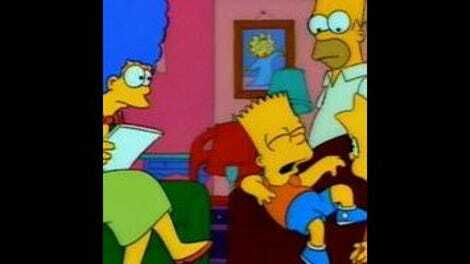 And then: Classic Simpsons reviews take the rest of the summer off. But don’t fret: Caroline Framke’s episode-by-episode take on Clone High’s brilliantly daffy, single-season run will be here to take The Simpsons’ place.